When it comes to summer camps and summer riding programs, March is the unofficial deadline for securing program spots, hiring staff and making sure all paperwork is filed correctly. Navigating the world of camps as a parent can be a bit scary, and as a camp organizer, even more! But never fear! Whether you are an organizer, parent, counselor or camper, The Equiery is here to help! When we asked camp directors what the biggest advice they would give parents looking to select the right camp for their children, the number one response we got was to make sure the camp is licensed by the state in which it is being run. “First of all, go take a lesson first to see if your child even likes horses,” said Karen Fulton of Full Moon Farm in Finksburg. 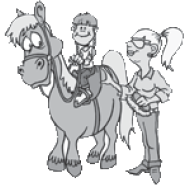 “Some parents send their kids to riding camp without ever having been on a horse before. But if they know how to ride already, make sure the camp offers what the kids wants to do whether that is trail riding, eventing, etc.” Full Moon Farm, which began running camps since 1996, offers sessions for all levels of riders as well as a specialty eventing camp week. “Look for a safe facility that has good recommendations from friends and other parents. Take a look around and ask yourself, is the program safe, fun and educational?” Gayle said. Finally, find out what else the camp has to offer. Many camps like Full Moon Farm and En-Tice-Ment hire schoolteachers as staff and directors who are able to bring in unmounted educational programs as well as arts and crafts. Waredaca’s summer program first started in the early 1950s with an eight-week overnight camp that included canoeing, archery, horseback riding and more. They transitioned into primarily a riding camp in the late 1980s and now, Waredaca has partnered with Bar-T Day Camp to offer a riding specialty program in addition to zip-lines, swimming, climbing and other outdoor activities. Maryland is fortunate to have schools from Elementary to High School that have their own in-house riding programs during the school year, some of which are open to the general public as well. During the summer, many of these schools, such as St. Timothy’s and Garrison Forest, offer camps to children beyond those enrolled in their school. Parents should also find out what sort of extra accommodations the camp may offer, such as early drop off or after care, or even snack breaks for younger campers and places to cool off in the heat of the summer. What to Bring to Riding Camp The Equiery asked parents, campers and organizers to send us their recommendations as to what to bring to camp. Here is a top 10 list of “must haves” for summer riding programs. As a camp director or facility owner, there is a lot to consider, from who your target market is, to whom you hire, to what paperwork is filed when, and what horses you use for your program. Full Moon Farm also uses the same instructors that are on staff year-round but uses junior counselors who are working students during the school year. Deana stated that her staff also attends continuing education programs throughout the year. As for horses, it used to be common practice to “rent” horses for the summer and send them back to the dealer that supplied them at the end of the summer. While this situation often works for programs that only run during the summer, most of the camp directors we spoke with run riding programs year-round, thus their summer horses are the same as their school year horses. “Waredaca uses ‘camp’ horses year-round in its recreational riding program but we may supplement with several summer leases as needed,” said Gayle. Karen added that they too tend to use horses already in their program for the summer. “We know these horses very well from teaching on them year-round,” she said. Renee stated that when Potomac Horse Center gets a new horse, an instructor rides it for at least a month before going into any student lessons. “This way we really get to know them before putting a student on them,” she said. 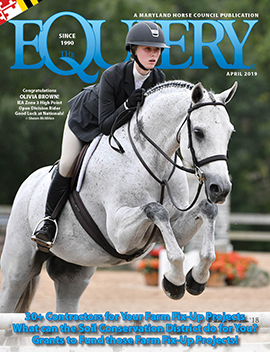 The above article is a quick summary of tips for selecting and operating a summer riding program brought to you by Equiery advertisers and staff. For a complete list of Maryland Youth Camp requirements, please see https://php.health.maryland.gov and search for “youth camp.” In addition, The Equiery’s Lesson & Boarding Stable Directory contains a list of over 500 lesson stables, many of which may offer summer riding programs.